Lil Uzi Vert and several fellow members of his XXL Freshman class have been subjected to extensive levels of contempt from hip-hop fans who don't care for the genre's latest trends. The Philadelphia rapper known for his brightly-dyed hair, heavy use of ad-libs, and Energizer Bunny stage presence performed for less than 45 minutes and utilized his microphone somewhat inconsistently, but was successful in leading the crowd of over 2,000 in numerous frenzied singalongs. 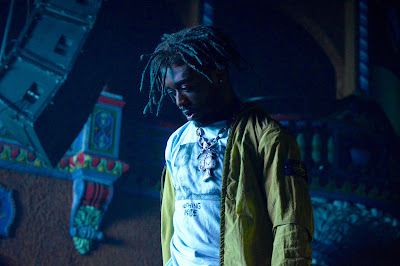 Lightning lit up the metro outside and the rapper's bootleg Metallica logo lit up the screen inside, all while Uzi proved that his music can be just as electrifying. The show was opened by Kansas City rapper Zarin Micheal. Micheal's half hour set was perhaps his most powerful yet. His ice cold delivery and powerful energy on EP cuts like "Blackface" sounded massive echoing through the theater. Manhattan-based rapper SuperShaqGonzoe's opening set contained a special gift for anyone following local hip-hop: a Rory Fresco performance. Fresco has quietly popped up at a couple other concerts this year, but not at one of this size. Front row fans sang along with his smash "Lowkey" and celebrated with the local hero on "On The Couch." Gonzoe's set concluded with Fresco and Micheal rejoining him for "Bounce" -- a song that sets off parties and shows without fail. With the help of DJ sets from #AssJamz and Yung Grandpa, Kansas City hip-hop showed how far it's progressed in 2016.